i really really really loved it.. it's been a while since i last had a really good laugh watching something but of course, it's not just funny.. the footstool players are really professional.. they act professionally with no professional props nor special costumes yet the message is so clear.. it's my third time watching their different plays and i think this is the best so far..
their next and final stop will be in kuantan on october 3rd so if you have the chance to watch it in kuantan, don't miss it !! i've been out from morning till night for about 10 hours and i'm so very tired right now.. so i guess that's all for now..
p/s. my sane dog is finally back tonight..probably because she was too hungry.. i hope she will remain sane even after tonight.. but that truly made my day as well - she, eating independently..
DO NOT use ur car wiper when attacked by eggs..! Don't use your car wiper if you were attacked by eggs. If you are driving at night and were attacked by eggs, do not operate your wiper and do not spray any water. Eggs mix water becomes milky and block your vision up to 92.5% and you'll be forced to stop by the road side and become the victim of robbers. This is a new technique used by robbers in johor bahru. so be extra extra careful... the society's really corrupted..
p/s. haven't been in the blogging mood lately.. nothing seemed to strike me to blog though i had such a great time catching up with high school buddies.. sleepover, dinner, badminton which caused bad muscle aches for the past 3 days, lunch, movie, korean bbq which burned my pocket, yum cha.. they were all AWESOME !! i always liked the saying which says : true friendship is reached when two friends are comfortable with the silence between them..
p/s/s. 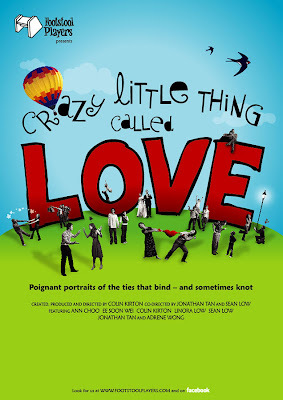 looking forward towards the footstool play titled, "crazy little thing called love" tomorrow ! check my facebook status if u got the ticket from me..
i received a shocking news today in church, over the phone when my dad told me that our opposite neighbour passed away.. the one who lived directly opposite my house.. the one whose age isn't consider an old age.. the one who invites us to his house on the first morning of deepavali every year.. he's not really close to me cause we don't talk much except when i go across during deepavali.. but i do give a smile when i see him outside sometimes..
he died of heart attack at 3pm and when we reached home, there were quite many people outside.. i saw his two sons.. one who is still in primary school if i'm not mistaken.. and one just a few years elder than me.. i wonder if they could take it but they looked really tough and seemed all ok from afar.. i wonder how would his wife be able to accept it.. and his mother too..
makes me wonder each time i hear of a friend's death.. what if it's someone close to me? i often fail to appreciate the people around me though i know one day, i'll surely regret it.. i kept reminding myself.. but i still fail to cherish the people i love.. i know, one day, i too will have to learn to face deaths of people close to me but i just hope it won't be too soon..
no one knows what's gonna happen next.. only God knows, for He has a plan designated for each and everyone of us and He knows best..
i guess this video should be a reminder to all of us.. to be grateful with what we have.. the ability to see, hear, and speak..
guess that's all for now..till then! p/s. had only watermelon for dinner for some reasons.. and felt hungry after 2 hours thus drank milo.. haven't drank the 3 in 1 milo at home since a very long time ago... i wonder what bad can excessive intake of watermelon do to someone?? it's finally over.. the day i dreaded.. the day which had been bothering me for almost the whole week.. the day which had been so burdening till i couldn't take it anymore but i held on.. and surely, God brought me through..
it wasn't so bad afterall.. led worship in youth for the FIRST time.. shared the message for the FIRST time which was really terrifying just thinking about it.. took over the guitar class for the FIRST time just for today..
wow... it's nothing great that i did all 3 in a day and i'm not trying to boast about what i did for it was all for God's glory.. worship leading is not easy.. it's my first time actually trying to synchronise with the band cause i usually just follow what the worship leader sings.. it's a totally different experience.. gotta really focus and know when to enter and u can't just stop singing whenever u feel like it.. sharing? haven't really spoken in front of a 'crowd' for 2 years already.. and i now know, don't type everything you planned to say onto the powerpoint.. guitar class? i'm not good enough to teach so it was just some basic stuffs the teacher taught me last year and indeed, not as easy as i thought it would be too.. takes more than just a desire to learn..
all in all... i'm still struggling to surrender everything to Him.. still trying to do things with my own strength most of the time.. i know it but i just can't.. i'm still trying.. i know it wasn't good enough because i still tend to hold back a lot...again, i gotta have more faith! the only extraordinary thing happened today which crossed my head is... getting fined for the first time.. for parking my car out of college's boundaries.. there's a "reserved" sign there.. i've never parked there before until last week or 2 weeks back when nothing happened even when i parked the whole day so i thought it would be fine since there were no other nearby parking lots available.. yeah, i admit, lazy-to-walk genes took place.. haha..
i'm really thankful that a friend of mine saw someone putting the notice on my car, nicely handwritten in caps ( which i was tempted to get a picture of it to post it here but was too panicked ) which says no parking and bla bla bla - fine rm50.. what?! 50 bucks? that would be so not worth paying.. i don't really know what happened after that, i moved the car, my friend showed the guard the notice, the guard talked to someone on a bike then nothing happened.. phew..thank God the car wasn't clamped.. i've really learned my lesson.. i won't ever park there again.. i'd rather walk further then to pay 50bucks, obviously..never knew it could be that serious..
p/s. i have a confession : i cheated to get this time stamp.. it's actually Sept 10th, 1.39am now.. i forgot the significance of blogging on the 9th till just now so the time stamp is adjusted.. hehe.. i sacrificed, i mean delayed some sleep time which means i'll wake up even later tomorrow.. indeed, everything has a price to be paid..
p/s/s. so much to do.. so much in mind.. mind feels so tensed up.. so lazy and tired as well.. i don't want saturday to come but at the same time wanna get it over quick..
p/s/s/s. oh yes, there goes a few more first times of mine - first time being fined (related to driving i mean), first time cheating on the time stamp and first time having a "p/s/s/s" on my post..
my dog has got an issue recently.. for about 2 weeks or more.. i don't know what's wrong with her.. she wants me or my sis or both of us to accompany her during her meal times.. she expects us to sit right next to her every time she eats, or at least stand there like pillars and watch her finish her food.. she leaves her food unfinished as soon as she realises we left her.. i should probably call that mental issue or psychology problem.. sometimes, it's because of lightnings and thunders or fireworks outside (which is normal for her to get terrified) but other times, there really isn't anything outside..
oh dear..if and only if i understand dog language.. i can't be accompanying her during all her meal times for the rest of her life and i really don't wanna get her pampered.. i'm really clueless of what to do.. i've given her a cold shoulder throughout the whole of today and i'll try to do the same tomorrow hoping she would understand why i did it.. i sometimes feel like breaking down seeing her like that.. it's so frustrating.. tonight, she didn't touch a single bit of her rice because she was so terrified by the faraway thunder sound, not even when i softly asked her to her bowl.. all she did was watch me from under the car.. it's like i have to beg her to eat the food i prepared for her..
save me from this misery... is she sick or what?? but it's not as though she has no appetite to eat.. i'm really clueless.. all i can do now is just pray that she would be fine again.. i guess prayer is the only remedy now.. that's all for now.. till then..
OH MY DEAR, DEAR, "PRINCESS"... WHEN WILL YOU EVER EAT JUST LIKE BEFORE AGAIN?? misery..observed by a police...new place and a new friend found..
do you know what's the most miserable thing in my life right now? it's the fact that i'm studying history again and it really stinks.. the lecturer gave us an open-book quiz today.. he only gave us really brief notes and good thing my sis has the text book so i borrowed it from her.. there were 2 essay questions which required not less than 500 words EACH which means 1000 words within 1 hour 30 minutes. i did think it was possible but of course it wasn't.. i read the question, opened the book and i wasn't even sure what to copy.. thank God i met a new friend and she helped me.. the quiz started at 2pm, due at 3.30pm but i only managed to submit it at 4pm.. the question paper did say that if we fail to fulfill the requirements or hand in more than 10 minutes late, 2.5marks will be deducted.. this quiz carries 10% for the finals.. 50 marks per question, which means, i am left with 7.5% = 75 marks.. and i just realised that i forgot to write my student id number on my answer script.. darn.. how many more marks gone, i don't know but it's disappointing and somehow bothered me when i was driving though it is so not important.. i've tried to put in so much effort yet i got penalised at the point i handed it in..
it's been a long time since i last wrote so many malay words in 2 hours.. a malay essay.. since spm about 2 years ago..wow.. i couldn't write 500 words for the second question though due to time constraint and clueless of the answer..my answer script was only 1 piece of narrow lined test pad, front and back..enough to fit 500 words in one page..the second page was only half or three quarters filled up.. history has been my enemy since standard 5 when kajian tempatan had some history elements in it.. i already knew history is not for me.. i battled with it, struggled through till spm, bid farewell and i so hate to meet it again now.. i just can't bear to study history anymore but i have to try my best to put away this hatred for the next few months..
as i was on my way to fetch my sis from college, i stopped at a traffic light which just turned red..first in line..it's a cross junction and i knew it would take some time for the light to turn green so i quickly sms-ed my friend to tell her that i've left college and when i put my phone aside, guess who was outside staring at me?? a traffic police !!! on his motorbike..OOPS..! i quickly looked away, act all focused on the road, worried he would fine me..thank God he just sped off when the light went green.. phew.. huge relief.. i wonder if sms-ing when the car is stationary at the traffic light is a road offence? my dad said it's not when the car is stationary.. then the police must have hoped i continued sms-ing when the car moves and that for sure will never happen..for now at least? i really don't unless i need to and that's when the car's stationary..
back home, my sis and i decided to go for a jog in polo ground cause i realise i really need to exercise.. wanted to play badminton, but no shuttlecocks..then my bro suggested we should go to a field nearby which we weren't really sure where.. so off we went.. me,sis and crystle-my dog..took quite a number of wrong turnings..made big rounds and we finally found the place..a really nice place with a jogging/cycling track, playground and gym-like equipments.. wow..!! it's my first time seeing colourful gym-like equipments just like the swings and slides in the playground but they're really exercising equipments..
crystle released some poop while she was chained somewhere on the grass.. a lady was there looking so my sis quickly grabbed a small plastic bag from the ground to pick it up while i went to get some tissues from the car and remembered there were no more tissues in the car so i took the maxis broadband brochure which had been lying on the dashboard since pc fair..tapao-ed the poop and threw it into the dustbin.. it's my first time tapao-ing my dog's poop..haha..anyway, i now know where to lose some fats.. a lot i mean.. haha.. a much more convenient place to go to..
back to the new friend i've mentioned.. some people, they're just so easy to be good friends with while some will always be the hi-bye friend.. i met this new friend, she's so nice,helpful and friendly and i'm excited to be closer friends with her.. and i'm really happy to know that she's a christian too cause i don't really get to meet christian friends in college except those in cf..she has a totally different background compared to mine and i feel blessed as i listened to her story..and i hope i won't regret being friends with her one day because i've met a few whom, after knowing them for a period of time, i stepped back because i felt i should and i think i tend to mix with the wrong people..i hope and i believe it won't happen this time though.. well, at least i gained something through pengajian malaysia class - a new friendship which made it more worthwhile for me to attend the classes..
i tried to keep this short but there's just too much in mind..different colours indicate different events..it's ok if you didn't read it cause i will read it again someday.. that's all for now.. till then !! p/s. everyone knows i LOVE tweety and everyone knows i HATE history..